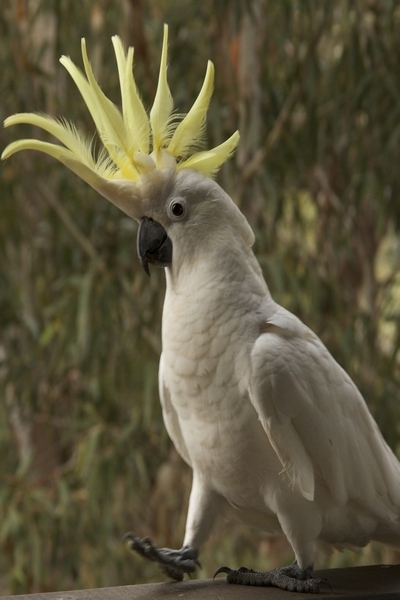 There is a Sulphur-crested Cockatoo perched on the American throne. Nobody – not even the CIA or the FBI – is entirely sure how he got there, but nonetheless there he roosts. Meantime it seems that the entire world has become fixated on the Commander in Chief’s goddamn hair and trying to work out what the hell it is about. But at last the secret of all secrets is out. The Commander’s beloved daughter boldly revealed the secret in Michael Wolff’s new book, Fire and Fury: Inside The Trump White House. Apparently the Commander has a bald dome, surrounded by a circle of hair. Every morning all the ends of his hair are pulled up to meet in the middle and then skillfully swept back and lacquered with hairspray. Furthermore, the sensational sulphur colour is due to a product called Just For Men. But here lies the problem – if the hair colour is left on too long, it results in a sultry orange-blonde colour. Which has been noted, perfectly complements the Commander’s heavily tanned face. It’s unusual in modern times for a man’s hairdo to attract so much attention. Usually it’s women in the public eyeball – such as female film actors, television personalities, models, politicians or world leaders – who have to put up with scathing critiques about their personal appearance. In the surreal world of television, a female news presenter’s hairdo becomes vicious Twitter fodder, whereas her male colleague can be as grey, bald or unbecoming as he damn well pleases. I’m currently reading Stacy Schiff’s marvellous non-fiction book, Cleopatra A Life, and was surprised to find Marc Anthony’s luxuriant, plump curls get a few mentions. Mind you, the man was also blessed with a bull neck, broad chest and a Dionysian personality which always helps in the charisma stakes. Schiff also does a nice job of drawing attention to Caesar’s thinning locks. Shortly before he was clumsily and savagely stabbed to death by his Senate colleagues, his hair morphed into a balding dome topped by a laurel wreaths. This regal getup complimented his white toga, man booties and purple cloak. Now there’s a thought. Perhaps the Commander could enhance his reputation with a few well-placed laurel leaves, calf-length Roman booties and a sweeping purple cloak. His attire would then audaciously whisper of political power, military precision and manly strength. After all – as the supposed Leader of the Free World – surely a bloke is entitled to do whatever is required to look the part? Photograph: cropped version of ‘Birds Strutting at Beacon Point, Victoria’ by Christopher Neugebauer 2012.